IMMACULATE!!! 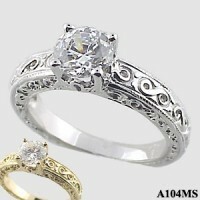 Antique style fancy scroll engraved engagement/solitaire ring... Gorgeous hand-made piece!!! Beautiful, Hand-Crafted, top quality Jewelry workmanship!!!.... Heavy ring, shank, & prongs... matching bands A107 or A108 available. Featuring a 1ct / 6.5mm Tradtional or Forever Brilliant Moissanite Stone. This item has been discontinued.